This is a special helmet comes with added features. Shade adjustment, sensitivity adjustment, time delay adjustment and anti jam on / off. This helmet is solar powered with battery backup. This helmet comes with the facility to use for grinding. It has a grinding function ON/OFF switch. 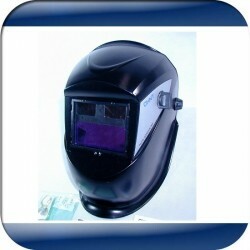 This helmet can be used for ARC, SMAW, MIG(Heavy), MIG (Light), GTAW, SAW, PAC, PAW Plasma welding. This helmet comes with the facility to use for grinding. This has a grinding function ON/OFF switch. This helmet has lager viewing area of 98 X 55 mm also has batteries and they are replaceable.